The KORE3 Hybrid Big-Brake Front Caliper Bracket Kit is the latest evolution in big-brake options for the early GM A/F/X-Body short-spindle applications. These brackets adapt 355mm x 32mm [14" X 1.26"] C6 Z06 rotors and twin-piston C5/C6 calipers to your early GM A/F/X-body muscle car for maximum stopping power and value. Please refer to the KORE3 Big-Brake Application Chart for details regarding specific vehicle compatibility. KORE3 Hybrid GM Short-Spindle kit is designed for forged short-spindles only, of which there are three (3) variations as described below. GM made a fourth short-spindle design that is not compatible with this kit. 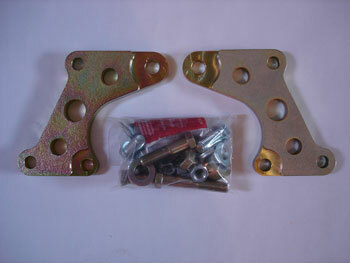 The spindle is cast, not forged, and can be readily identified by the integral cast caliper mounts and steering arms. Kit is 100% bolt-on. No welding, cutting, or grinding necessary if KORE3 components are used.